Jacob Waguespack does not have any MLB stats for the season. Draft: 2012, Pittsburgh Pirates, 37th rd. Jacob Daniel Waguespack ... Attended Dutchtown HS in Geismar, Louisiana ... Was originally selected in the 37th round by the Pittsburgh Pirates in the 2012 draft but went to the University of Mississippi in Oxford, MS instead ... After going undrafted in 2015, signed a Minor League deal with the Philadelphia Phillies on June 22 ... Finished his degree in managerial finance at Ole Miss in December of 2018. Split the first 21 games of his season between Double-A Reading and Triple-A Lehigh Valley ... Combined for a 4-6 record while making 15 starts between the two clubs ... Was traded to the Blue Jays in exchange for LHP Aaron Loup on July 31 ... Joined Triple-A Buffalo after the trade and set a Bisons debut record as he struck out 12 batters on Aug. 2 vs. Lehigh Valley (6.1 IP, 8H, 4ER, 1BB), just two days after changing clubhouses at Coca-Cola Field ... 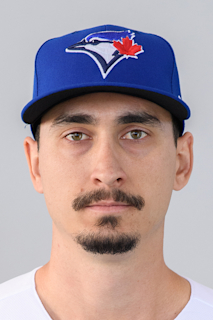 Finished with a 2-4 record and a 5.03 ERA across seven games (six starts) for Buffalo ... Was added to Toronto's 40-man roster after the season to protect him from the Rule 5 Draft. Started 2017 with Advanced-A Clearwater and with 6-5 with a 3.29 ERA across 24 games (10 starts), including 73 strikeouts in 68.1 innings of work ... Finished his season with seven games (six starts) for Double-A Reading where he posted a 3.65 ERA and punched out 35 batters over 37.0 frames ... Was assigned to Triple-A Lehigh Valley on Sept. 6 for the IronPigs' playoff run ... Made one postseason start, allowing just one run over 7.0 innings on Sept. 10 at Scranton/Wilkes-Barre (3H, 2BB, 7K). Spent his entire 2016 campaign with Class-A Lakewood ... Made 43 relief appearances struck out 72 batters over 71.2 innings... His 43 games played tied for 3rd most among South Atlantic League pitchers. Split his first pro season with the Rookie-level GCL Phillies (4G) and Class-A (short) Williamsport (15G) ... Recorded 25 strikeouts, a .132 opponents' batting average and a 0.42 ERA over 21.1 innings while with Williamsport. March 12, 2019 Toronto Blue Jays optioned RHP Jacob Waguespack to Buffalo Bisons. November 20, 2018 Toronto Blue Jays selected the contract of RHP Jacob Waguespack from Buffalo Bisons. August 2, 2018 Buffalo Bisons activated RHP Jacob Waguespack. July 31, 2018 Toronto Blue Jays traded LHP Aaron Loup to Philadelphia Phillies for RHP Jacob Waguespack. July 31, 2018 RHP Jacob Waguespack assigned to Buffalo Bisons. July 12, 2018 RHP Jacob Waguespack assigned to Lehigh Valley IronPigs from Reading Fightin Phils. July 6, 2018 RHP Jacob Waguespack assigned to Reading Fightin Phils from Lehigh Valley IronPigs. July 2, 2018 RHP Jacob Waguespack assigned to Lehigh Valley IronPigs from Reading Fightin Phils. June 14, 2018 RHP Jacob Waguespack assigned to Reading Fightin Phils from Lehigh Valley IronPigs. May 25, 2018 RHP Jacob Waguespack assigned to Lehigh Valley IronPigs from Reading Fightin Phils. May 21, 2018 RHP Jacob Waguespack assigned to Reading Fightin Phils from Lehigh Valley IronPigs. May 14, 2018 RHP Jacob Waguespack assigned to Lehigh Valley IronPigs from Reading Fightin Phils. May 12, 2018 RHP Jacob Waguespack assigned to Reading Fightin Phils from Lehigh Valley IronPigs. April 21, 2018 RHP Jacob Waguespack assigned to Lehigh Valley IronPigs from Reading Fightin Phils. April 14, 2018 RHP Jacob Waguespack assigned to Reading Fightin Phils from Williamsport Crosscutters. April 9, 2018 RHP Jacob Waguespack assigned to Williamsport Crosscutters from Reading Fightin Phils. April 2, 2018 RHP Jacob Waguespack assigned to Reading Fightin Phils. September 6, 2017 RHP Jacob Waguespack assigned to Lehigh Valley IronPigs from Reading Fightin Phils. July 31, 2017 RHP Jacob Waguespack assigned to Reading Fightin Phils from Clearwater Threshers. June 14, 2017 RHP Jacob Waguespack assigned to Clearwater Threshers from Lehigh Valley IronPigs. June 10, 2017 RHP Jacob Waguespack assigned to Lehigh Valley IronPigs from Clearwater Threshers. April 2, 2017 RHP Jacob Waguespack assigned to Clearwater Threshers from Lakewood BlueClaws. March 11, 2017 RHP Jacob Waguespack assigned to Philadelphia Phillies. June 7, 2016 RHP Jacob Waguespack assigned to Lakewood BlueClaws from Williamsport Crosscutters. June 4, 2016 RHP Jacob Waguespack assigned to Williamsport Crosscutters from Lakewood BlueClaws. April 2, 2016 RHP Jacob Waguespack assigned to Lakewood BlueClaws from Williamsport Crosscutters. July 21, 2015 RHP Jacob Waguespack assigned to Williamsport Crosscutters from GCL Phillies. June 22, 2015 Philadelphia Phillies signed free agent RHP Jacob Waguespack to a minor league contract. June 22, 2015 RHP Jacob Waguespack assigned to GCL Phillies.